grfC Day7: All I want for Christmas… : Nail of This Week. 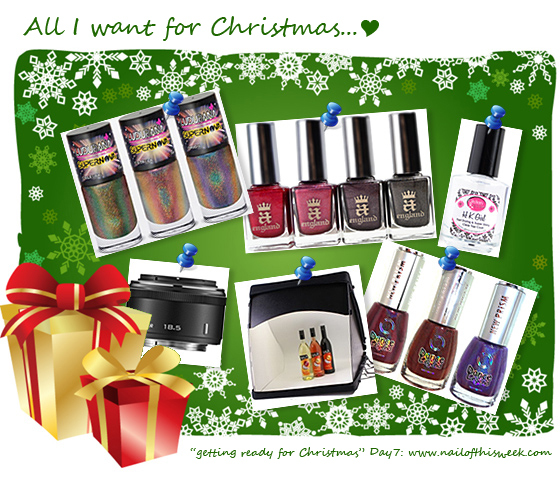 So on 7th day of getting ready for Christmas challenge, it doesn’t say anything for nail or makeup…but the WISHLIST! 3) I’m still looking around for my holy grail topcoat…especially because my (or even OUR) holy grail essence’s better than gel nail top sealer has been discontinued *sob sob* :’( I’m trying out few of new stuff now, but still want to try other’s holy grail such as Glisten & Glow’s HK girl top coat. 5) I’m still struggling for the lighting and shooting environment during taking swatch/mani pics. One of the item which caught my mind recently is the light box with the built-in lamps. Above is just an example, I’m still looking around which one will be great, but yes I’d like to have one of these someday. 6) Finally, small lens for my…no, my hubby’s camera. Sometimes we share the camera because some case his camera shoots better pic than mine (even compare to my new baby). However he doesn’t own bright lens which can be used for close-ups or dark place; so this is the one. Have you tried the "new" Btgn Top Sealer High Gloss? I don't find it any different than the first version, so I'm glad it's still around.